This entry was posted on April 28, 2016 by Jessica Anderson. 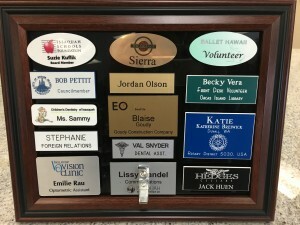 Name tags are a best seller at Trophies2Go, as we create name badges for many organizations across the country. But what makes name tags a worthwhile investment for companies? Name tags and name badges are useful customer service tools that can aid customer satisfaction in a number of ways. All the staff at Century Link Field, home to the Seattle Seahawks, wear name tags made by Trophies2Go. 1. Professional: Matching name tags to your company logo reinforces your brand and gives credibility to your employees. 2. Helpful: Name tags help identify employees and distinguish them from customers. It's easier to get help from staff when they wear this visual queue. 3. Personal connection: when you know a person's name, it makes establishing a relationship that much easier. And in business, people buy from people they like, so creating this emotional connection between staff and customers is important for customer retention. 4. Accountability: Employees know they have to do a good job when they wear a name tag. No longer anonymous, employees are accountable for their actions. 5. Recognition from customers: When an employee goes out of their way to help a customer, a customer can leave a positive review if they know the person's name. A sampling of different name tag styles made by Trophies2Go. 1. Rotary Engraving: The plastic is etched with a diamond tip rotary engraver. The machine grooves the letters out of the plastic, exposing a different color. This results in 2-color name badges. 2. Laser engraving: The plastic or metal is etched using a laser beam. This method is useful for complicated logos and graphics that require fine details that a diamond tip engraver can't do. 3. Sublimation: this process uses dye which is heated and fused directly into the name tag material. Sublimation is the best way to create full color name tags with multiple colors. There are also many options for attaching name tags. We offer 3 different styles of backing depending on your needs. 1. Pin back - the cheapest option, this is the traditional way to attach a name tag, by pinning it to your clothing. However this can leave holes in fabric and prick skin. 2. Magnet back - a powerful magnet attaches the name tag through clothes without damaging the garment. This is the most popular backing option we sell, but it is an upgraded cost. 3. Alligator clip - this option has a clip back that can attach to a lapel, collar or a lanyard. This option required a hole at the top of the badge in order to attach the clip. 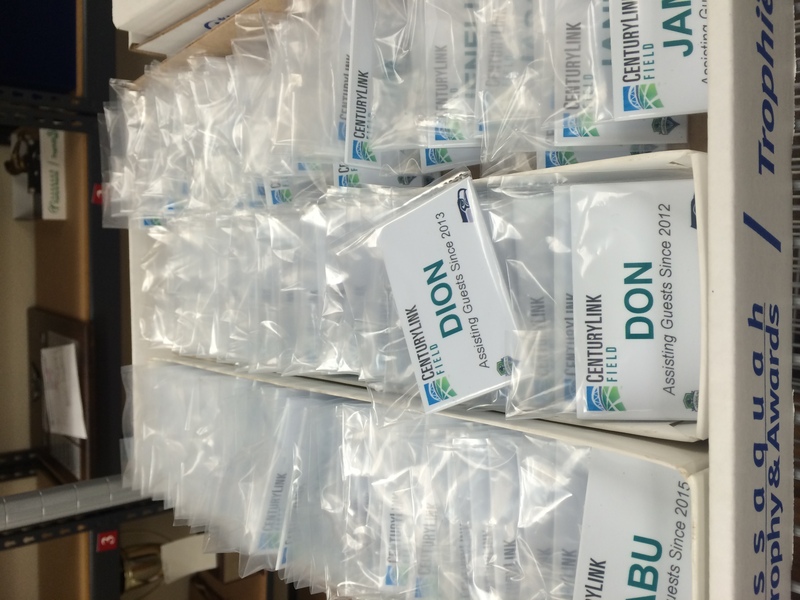 All personalization, including employee name and job title, are included in the price of every name tag we sell - it's no problem to make each tag different. 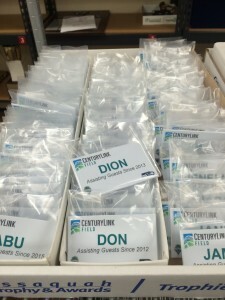 To save time and money, batch your name badges together so that you can qualify for quantity discounts; they are cheaper when you buy in bulk. Also our name tags can be made quickly, as fast as 1-2 days. Just give our friendly customer service team a call to find out more. Browse our Name Tags Category to see all of the choices. Here's to marketing your business and identifying your staff to your customers!